When the snow begins to blow you may wonder what the birds that don’t migrate south for the winter are thinking. Birds are actually very hardy creatures built to withstand cold temperatures as long as they find food. Most birds will fluff up their feathers to cover their feet and create air pockets that will help them keep warm like a down jacket. Birds that perch also scrunch down to sleep because that automatically makes the toes grip their perch and stay locked. In the legs of most tree-dwelling birds, tendons extend down the leg behind the ankle to attach to the tips of the toes and when their knees bend, the tendons are pulled taut, making the toes on their feet clench. Even on windy nights, this grasp cannot be released until they wake up and their limbs are straightened again. 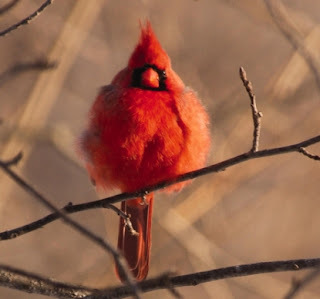 Another way birds combat the cold is by shivering. This converts muscular energy into heat for the short term, but the energy must be replenished shortly thereafter. By keeping your feeders filled with high energy, high fat foods you can provide your birds with the vital nutrition they need to survive. High on the list of best choices to meet this nutritional need is suet or seed blocks and certain seeds like peanuts, sunflower and nyjer seed.